Daryle Singletary is one of the few remaining representatives of the 90's pure honky tonk, so if you like Mark Chesnutt, Tracy Byrd, Joe Diffie or Tracy Lawrence, make sure not the miss Daryle's show in Germany. The Four Corners is a genuine Texas honky tonk located in Untermeitingen, about 50 km to the west from Munich, Germany, and hosts remarkable artists on a regular basis. 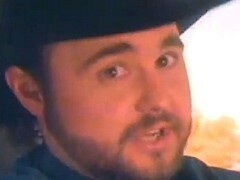 Daryle Singletary - "Too Much Fun"